Oil-free? Nope. Not one bit. I actually aimed to cover every bite with a touch of coconut oil in this recipe. You might be asking what the big deal is, but a lot of vegans these days are following a high-carb, low-fat diet (HCLF) which omits oil as much as possible, mostly for health reasons, but also for environmental and cost reasons, I'm guessing. I'm not bashing the diet in any way, so don't get me wrong. I just want to explain where I stand. My one-year vegan-versary just passed, and about a month from now marks my first few steps toward the HCLF lifestyle. I'd been following a few Instagram accounts and felt inspired by their proclamations of clear skin, high energy, and simple, inexpensive diet, so I gave it a try. Again, my point here is not to give a bad name to anything or anyone HCLF - I just want to share how it worked (or didn't work... oops - I think I just gave it away) for me. After two or three weeks of loading up on potatoes, rice, beans, bananas, and other fruits and veggies. I tossed out oils and most fats, even my favorites like dark chocolate, nut butters, and dairy-free yogurt/ice cream. My workouts stayed just as intense, and may have actually become increasingly more intense than before. To make a long story short, I wasn't eating enough. And I wasn't tracking my calories so the only indication of my malnutrition was my quickly dropping weight. Around Halloween time (wow - I got the timing just about perfect, huh? ), I really got into HCLF, but again, I wasn't nourishing properly. After all, who could eat six or seven bananas for breakfast everyday? And three huge bowls of salad? Not me. But I didn't really try. I'll admit - part of me (still not fully ED-recovered) thrived off of the minimal calories, the low-fat, the extremely clean eating. I've never admitted that before, but there it is. The Halloween celebrations passed, and I remember flipping through pictures from nights out dressed up with my friends and choking on the lump in my throat when I saw my ribs through my shirt, my knees looking as though they were ready to poke through my skin. Speechless and terrified, I turned away from the picture and closed my tear-filled, blurry eyes, turning inward to ask God for h e l p.
Lord, I'm broken and I cannot fix myself. I'm scared and I cannot see where I'm going. I'm in need and I cannot satisfy. I've been seeking treasures of this world and finding them and myself empty. Fix me, lead me, help me, fill me. God did NOT make me wait there. He saw all that I was and wasn't and was trying to be and couldn't be. He saw my malnourished body and my lost heart. He held me and convinced me of my beauty and my purpose. He blessed me with a healthy mindset towards food and exercise and, for the first time in over 1.5 years, reminded me of one of the most fundamental parts of who I am in Him - a daughter, a woman - by giving me my period back. I lost it during my eating disorder and I'm sure it only drifted farther away the less I ate on my attempt at HCLF vegan. During my HCLF attempt, I remember some nights I felt so uncomfortably full, trying to eat enough to meet my caloric needs, and I remember other nights I felt hungry as I lay in bed, trying to forget about that not-HCLF cookie I ate. Either way, I just couldn't find satisfaction. Either sick from too much of the world, or deprived of something I hoped it'd give me. Overcoming my fear of fats and oils challenged me for months, but when I re-promised my life to the Lord, He worked so powerfully in my mind and heart to solidify His truth that n o t h i n g is of higher value in my life than His love for me. No "rules" should exist around something so simple as food, so He broke mine down and brought me such comfort in returning to my original vegan lifestyle, perfect just the way it was. I look back on the last twelve months and can note that a) my jeans have gotten tighter, b) my cheeks and maybe even chest (a teeny bit) have filled out, c) my fridge and pantry occupants have changed from potatoes and bananas and rice to peanut butter(s) and cereal and vegan cheese and veggie burgers and chocolate (mmmm, chocolate). Best part? I've regained my period. Want me to repeat that? I'VE REGAINED MY PERIOD! Lord willing, I could have children someday. Period or no period, though, I can sit on the couch with a bowl full of three different ice creams (vegan, of course) two or three times a week. Guilt-free. Fat-loaded. Grateful, saved, blessed, inexplicably joyful. 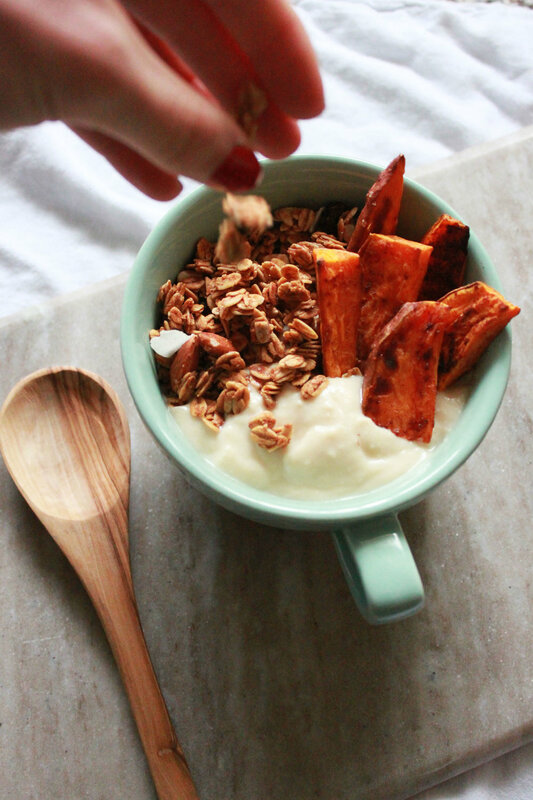 And with that, I give you some crispy, definitely not oil-free roasted cinnamon sweet potatoes with chunky granola and creamy dairy-free yogurt. HCLF? No. DELICIOUS? Heck yeah. Preheat oven to 425 degrees F. Line a baking sheet with parchment paper and lightly grease with coconut oil. Chop sweet potatoes into wedges and coat with coconut oil, cinnamon, and sea salt. Spread evenly on the baking sheet and bake for 35-40 minutes, flipping halfway through. Remove when they look crispy and almost burnt (keyword there is "almost"). Let them cool before removing from the pan. In the meantime, assemble the bowl by adding a layer of granola, then the yogurt on top, followed by more granola and, finally, the sweet potatoes. Top with desired extras like cinnamon and raisins.